A couple of months back I already shared that CSA Day was my favorite day of the week but the reality is that fall is here and tomorrow is the official last day of summer here in the Pacific Northwest. October arrives and we are told to expect wet and cloudy weather from here on out until the spring, so I’m savoring every veggie pick up day and every farmers market. This week we cam home with some lemon squash which I’m excited about tasting. The size of the squash available this week was massive, but I’m not a believer that bigger is always better, so I stuck with the more manageable small guys. With that said, walking into the barn and seeing the monster squash does make me pretty excited. We lingered a little bit on the farm this time around. Picking beautiful purple Dahlia’s and Swiss chard for our u-pick items and then marking our pumpkin which we will pick up on the last day of the CSA….but we won’t talk about that right now. The turkeys on the farm are getting bigger. We sat and watched them run back and forth discussing with Jess, one of the girls who works the farm, how they’ve fared with their chickens and turkeys this year. We’ve already put down our deposit on one of those birds who will find itself on our table for Thanksgiving. I enjoy knowing where my food is coming from, but I have to admit that I feel a tiny bit guilty being entertained by these feathery, quirky creatures and knowing that one of them is going to be dinner. With that said, this is part of the reality. While these are cute creatures, they are food. This is the circle of life, especially on a farm. Living in the city, I did realize that the meat I was buying was once a live, thriving animal. I tell my vegetarian friends that while I’m going to eat meat, it is important to me that my meat was happy, running around in the sun during the duration of its life. But now, I see the chicken, turkey, cow or pig that may end up as part of a meal on my plate and as an animal lover, that can be conflicting sometimes. I’m planning on raising our own chickens for eggs by next spring, and while I’m not raising them for meat, there will come a time when those chickens don’t lay eggs anymore and I’ll have to decide if my egg endeavor is a hobby farm operation or are those girls going to eventually be additional pets for the Peters pack. Going to the farm each week is therapeutic for me for many reasons. It gets me out of my office at the beginning of the week, we get to meet fellow CSA shareholders and it’s probably going to prepare me for having a few farm animals of our own. I didn’t get my ocean view, but I do get to find the ocean and that can mean heading with Moonpie and the Lady Labs to Double Bluff Dog Beach. The ocean has always been special to me, but add our pups to the scene and it is pure joy. Watching the girls run up and down the beach at full blast makes us laugh every time. The one member of the pack that surprises us the most on our trips to Double Bluff is Moonpie. When we left Texas, Moonpie had been suffering from arthritis and seemed to not be into life at all. She’s our oldest dog at 13, but she may be our favorite (sshhhh….don’t tell the Lady Labs). Since moving here, Moonpie has seemed to come into her second wind. She’s spunky, demands treats and she heards the Lady Labs all around the back yard. 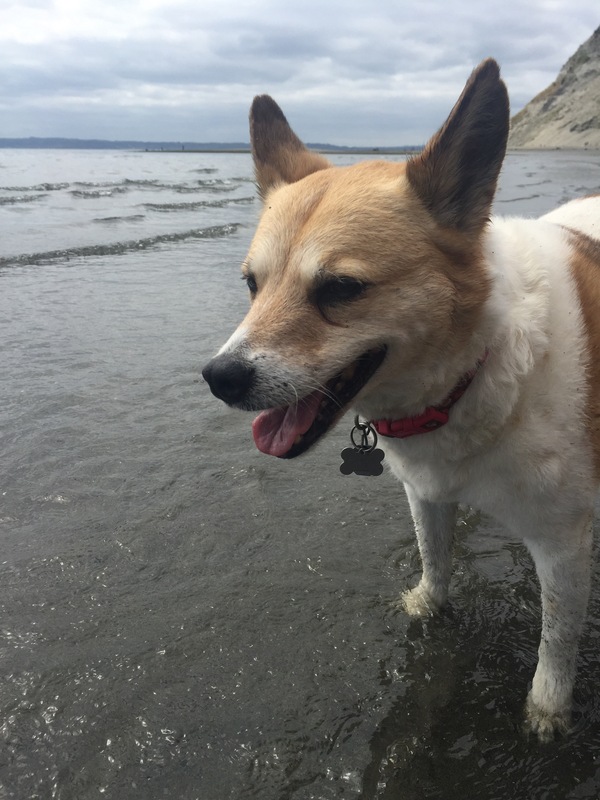 She loves running the trails at the Greenbank dog park and here on the beach. Life is good if you are a Moonpie. And why wouldn’t it, when you have beach, salty Sound waters of the Salish Sea and mountains beckoning you to run.